WORKSOP TOWN had a brilliant season last year, scoring goals by the hatful and finishing a playoff place in the Northern Premier League. They didn't progress and worse was to follow when the club owner pulled out all funding. The club jumped the gun and resigned from the NPL. This turned out to be in haste as the supporters trust were putting together a plan to save the club. They tried to withdraw their resignation, but the league stood firm and were not letting them have their league place back. Luckily, the Northern Counties East League were happy to take them on, and they joined it's Premier Division. The league will still run with 21 teams though, owing to the demise of Wakefield, who were forced to resign due to financial difficulties. 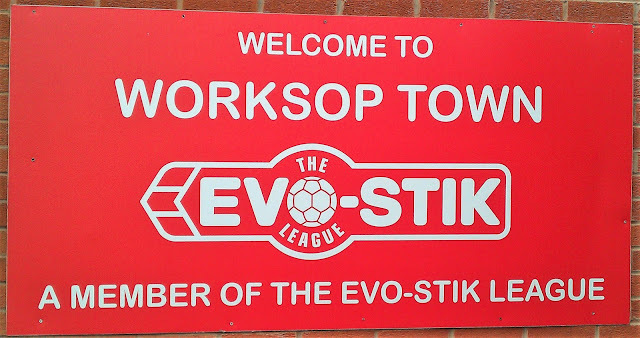 Worksop have not been without financial issues in the past, they lost the ownership on their ground to league opponents Handsworth Parramore (formerly called Worksop Parramore and Sheffield Parramore). This time out, a famous face stepped in to lend a hand, golfer Lee Westwood's generous donation getting them out of a tight spot earlier this summer. Hopefully, the club can return to its former glory - they once graced the Conference North not so long ago and got to the FA Cup 3rd Round in the 1950s. I'd wanted to go to Worksop Town for a while, and had indeed planned to go last year on the way home from up north. But an error in my Sat Nav file directed me a lot further south to their groundshare at Hucknall Town. It actually turned out to be a blessing in disguise - I ended up at Matlock Town which was a cracking ground, and the person that I was supposed to meet could not make the game anyway as work called him away at the last minute. It was a shame that I would never get to see last season's side which scored (and conceded) so many goals and had just missed out on the playoffs. But it wasn't to be, and after financial issues in the summer, they were relegated to the Northern Counties East League, which was my favourite of the step 5 leagues. I first heard about this FA Vase game through another mate, Luke, who is a Chesterfield fan who lives in Worksop told me about it, and as my parents would be away that week, I said yes to it. I knew it would be tight getting out of work, and it would cost a fair bit in petrol, but then fellow groundhopper Anwar said he would come with me. Sadly he couldn't make it after all as he had a load of bills come in at the same time, and also he was ill. Had it not been for me meeting a mate, I'd have given it the elbow, but I had given my word and I wasn't backing out. On the day of the game, I had an unusually busy day at work for a Sunday, which was really the last thing I needed. I'd been checking Twitter every now and then, as well as the BBC weather site as I was a bit concerned about being on due to the rain. In the end, I finished at 11 and had a quick 15-minute break to get ready before leaving at 11.15. I had one last check, and happy that the game would go ahead, I set off up north. With an ETA of 13:56 I made good time, and the journey was good apart from having to go slowly through the extensive roadworks on the M1. I arrived 10 minutes ahead of schedule at 1.45, parking as directed by the friendly steward. After paying a very reasonable £5 for entry and £1 for an excellent programme, I made my way to the club shop. This little cavern of delights was one of the main reasons I wanted to come here, with a huge range of programmes and lots of other stuff. Though they didn't have any of the ones that I needed, I still got a couple of old 'Non-League Digest' magazines, plus a Worksop Town pen. Sadly, shops like this are a dying breed, as clubs go towards a more profitable leisurewear-only operation, or indeed not bothering at all. As I was coming out of the shop, I bumped into Luke and we got a picture together and chatted about football and had a good catch up. I was hungry by then and so went to the tea bar. 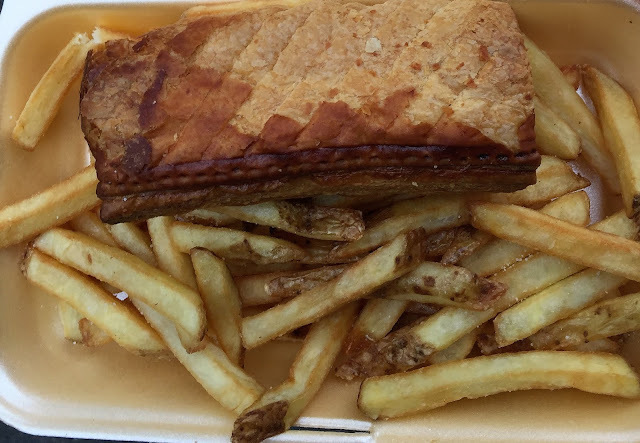 I got a decent sausage roll and chips which filled me up and cost me only £2.50. Normally I would have a pint too, but I'd had quite a lot over the past couple of days, so I gave it a miss. I was gonna go to a nice looking pub in town called 'The Mallard' but my later than wanted arrival put pay to this. 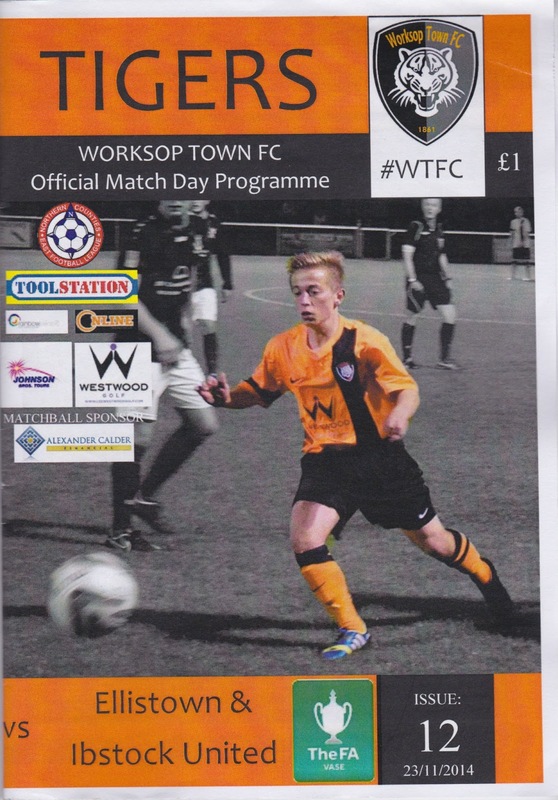 I stood behind the goal that Worksop were attacking with Luke and a few other people he knew to watch the game. 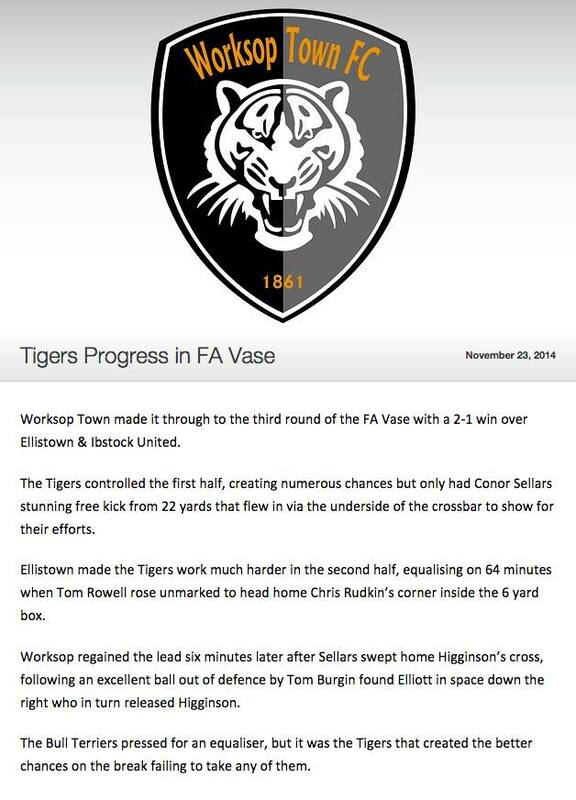 You can see the report from the Worksop Town website below. After the game, I said my goodbyes and made my way back to the car. As I was about to drive off I saw my mate and fellow groundhopper Tony as he was parked in front of me and we said a brief hello and goodbye as we left for home. For me, it was a different route home. I'd come up the M40, M42 and M1 on the way up, but as I was going back home it took me down the A1. It was frustrating at first as both lanes slowed right down when lorries got in the 'fast' lane and bought everything down to 50MPH just so they could go a fraction faster than their fellow trucker. Soon enough it opened up to more lanes once we got into Hertfordshire and the M25 was even well behaved for once. I got in at 7.45 and I spent the rest of the evening relaxing and watching TV before going to sleep at 11PM. SANDY LANE is one of the better grounds at step 5, thanks to them being in the NPL last season. 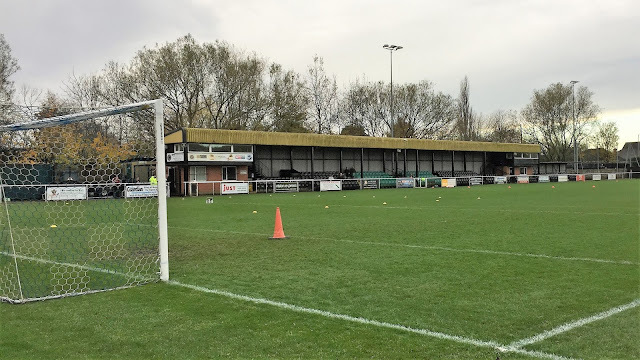 It's actually owned by the other Worksop team Handsworth Parramore, who also play in the NCEL Premier, though it was Town's ground originally. 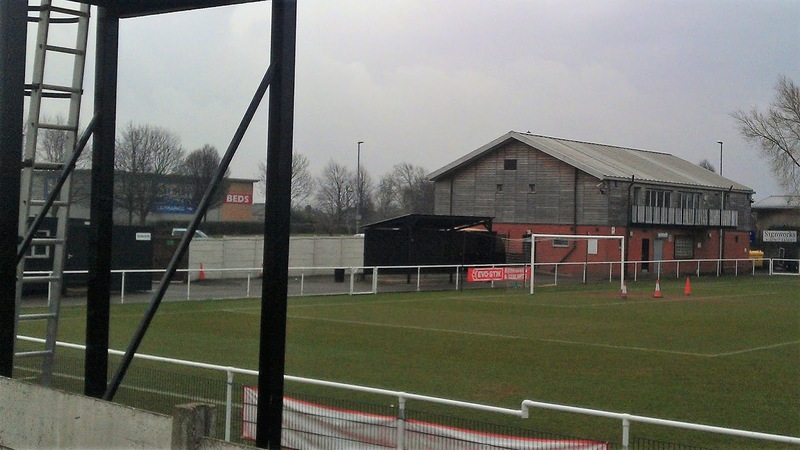 The main stand holds around 300, whilst there is more seating in the form of metal stands behind one goal and a couple along one side near the dugouts. As for covered terracing, there is s stand that holds around 250, whilst the seats total 1000. The ground holds around 3000 in all. The club shop and tea bar are great, whilst there is also a bar at the ground. The town is walkable, but sadly I didn't get to check it out.